In the real world engineers are only concerned with stability within certain physical limits. GALENA again introduced a better way of searching with the concept of Restraints, to allow you to focus your investigations on realistic failure surfaces that take account of geological conditions or structure. GALENA's Restraints are based on those parameters and values that are used to define a failure surface so that you have total control over the extent of the search area. As an example: You are considering a slope where you have concluded a circular failure surface to be most appropriate. Restraints allows you to limit all trial failure surfaces to daylight at the toe of the slope, which we will take to be the X-Left position for the failure surface. Restraints also allows you to define a range for the other end of the failure surface, which will be the failure surface X-Right position, and a range for the failure surface Radius. All failure surfaces then generated by GALENA will be within the ranges defined for the X-Right position and the Radius, and all failure surfaces generated will have the same X-Left position. Restraints can of course be used to provide search limits to any of the parameters used to describe circular failure surfaces, including the more traditional abstract points in space used to define a circle centre. Restraints can also be used in a similar way to provide search limits for non-circular failure surfaces, and truly provide you with control over search areas. As well as providing search ranges Restraints allows you to define the number of trial surfaces to be generated and analysed within each of those ranges. The actual number of trial surfaces is up to you; GALENA can generate and analyse up to around 1 billion trial surfaces for each analysis, although it would be extremely rare to even attempt such numbers. The norm would be to follow a sequential 'fine-tuning' approach with around 3,000 - 5,000 trial surfaces for an analysis, followed by further analyses using the critical failure surface as a seed. So, as you can see, Restraints provides you with a very powerful mechanism, that gives you real control in the real world. The image below shows a model with an embedded material lens and unevenly distributed load behind the slope crest - in this situation the critical failure surface is expected to daylight at the slope toe, and within the range of the load. Restraints allow the user to define the horizontal search range for both the left and right intersects of the failure surface (with the slope surface), and for the radius search range. Restraints also allow the user to fix the left position of the failure surface (as is most likely in this case), and to concentrate the search for a failure surface with the lowest Factor of Safety in the area around the upper evenly distributed load. Restraint ranges are displayed with a black hatch during definition (as shown below), and with orange bands otherwise on the slope surface around the left and right failure surface positions. 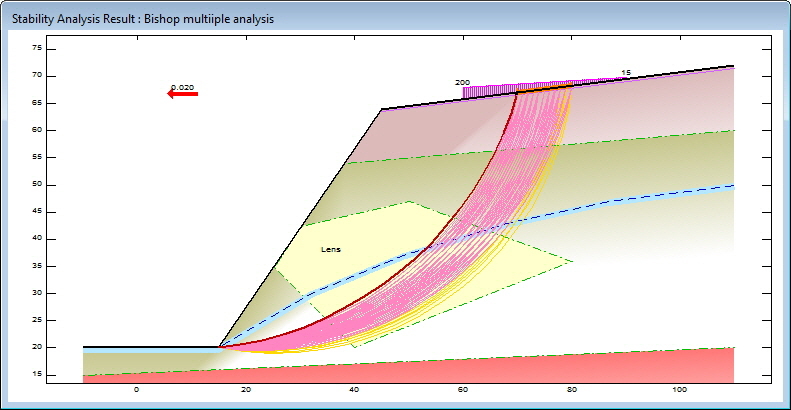 The image below shows the results of the analysis - failure surfaces with a Factor of Safety between 1.0 and 1.20 are shown in pink, while the critical failure surface is shown as a thickened dark red line, in this case at the left extremity of the X-Right restraint range, indicating a further multiple analysis should be undertaken using the critical surface from this analysis as the starting point (using GALENA’s Critical Failure Surface definition option). 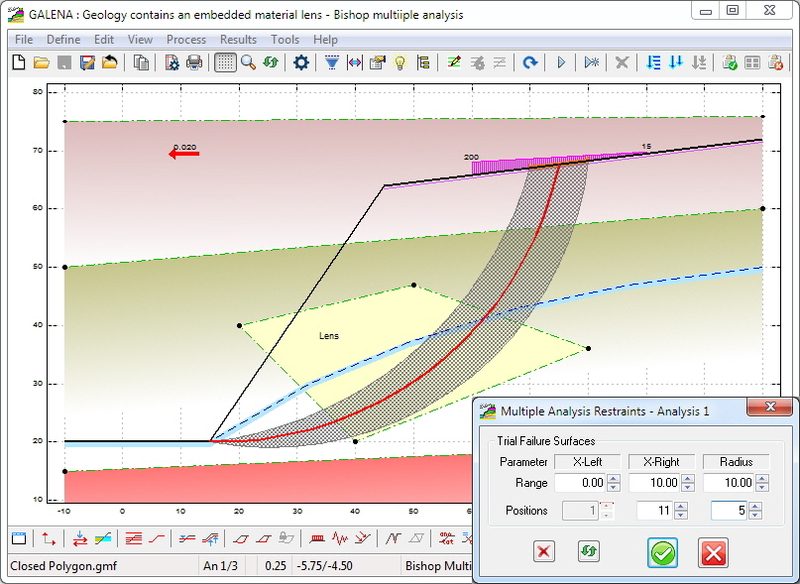 Failure surface colours are user-definable for various Factor of Safety ranges, and the number of failure surfaces displayed is user-controlled - you can even interactively see the Factor of Safety for an individual failure surface.